The first animals visitors see during a trip to the Aquarium is usually the harbor seals. Their outdoor exhibit on the front plaza lets you get within inches of these plump pinnipeds to watch them bask on flat rocks, bob or glide through the water. It's such a thrill watching people—young and old—light up when they see the seals' faces, especially when the seals interact through the glass. A recent visitor shared this image of his daughter going nose-to-nose with Chacoda. Will you look at the delight on her face?! Thank you for sharing your picture, Bill Woods. Chacoda is from our family of spotted seals. He's known for his painting masterpieces, clean teeth and his sporting prowess. But what really gets people's attention is his voice. Listen to him cheer for the Patriots. In fact, you can even download a Chacoda ringtone—no joke! 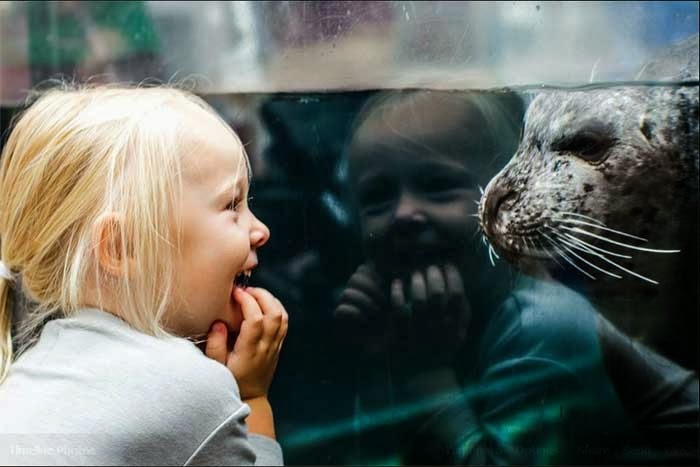 Come by the Aquarium this weekend and see if the seals want to interact through the glass. Want to get even closer to a seal? Like, in the water with a seal? Consider our Take a Dip with a Seal programs with the fur and harbor seals! Before the weather turns cold for good, don waders for one of these incredible interactive experiences. Get a front-row seat as a trainer teaches new skills, feel the seal's belly fur, maybe even get a kiss.